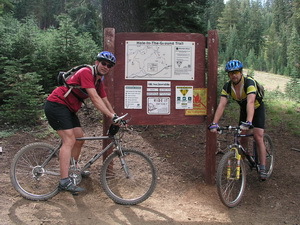 This blog will primarily discuss topics about the Donner summit area. Constructive feedback comments are always welcome. This week with the spring melt still in flow we hiked over to see Palisade Falls. While the flow wasn’t at it’s peak, the falls were still spectacular. This is without a doubt one of the most beautiful spots on the Summit. The schedule for the 2016 summer hikes in conjunction with SLPOA is now available. 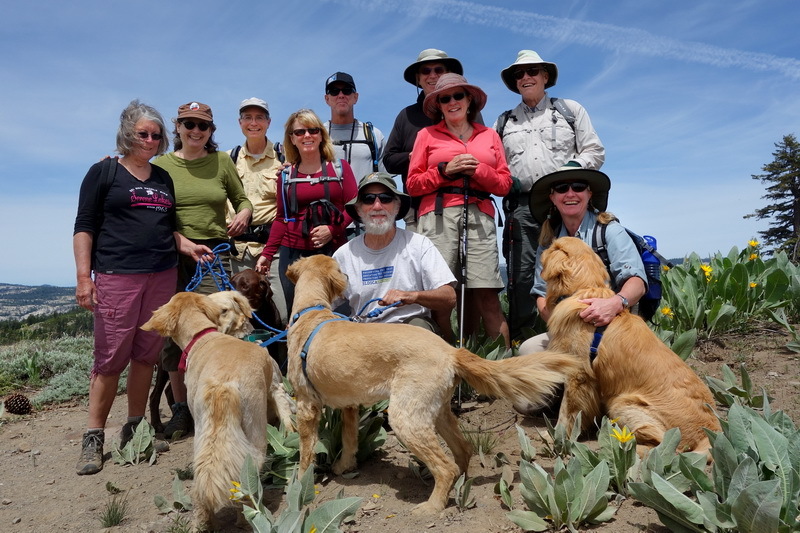 These hikes are led by George Lamson and Linda Cashion with their three golden retrievers, Calla, Maggie and Lily. 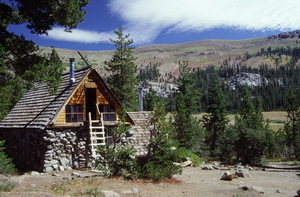 The hikes are spread around the Donner Summit area and are designed to explore the summer wonders of the Summit. This year we will be trekking up to the highest source of the South Yuba River located near Roller Pass along the Pacific Crest. 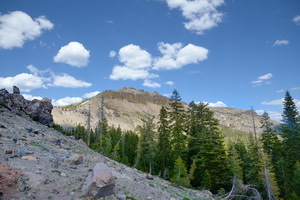 We will also be hiking some of our favorite trails that offer spectacular views of the Donner Summit area. Everyone is invited to join these hikes. Some are more strenuous than others so you pick that one that piques your interest and suits your ability. Besides the exhilaration of getting out in the forest these hikes are meant to be a source of information about all things Donner Summit. Hope to see you out there. This week it was announced that the US Forest Service has acquired the 408 acres along I80 on which the trailhead to the Castle Peak area is located. 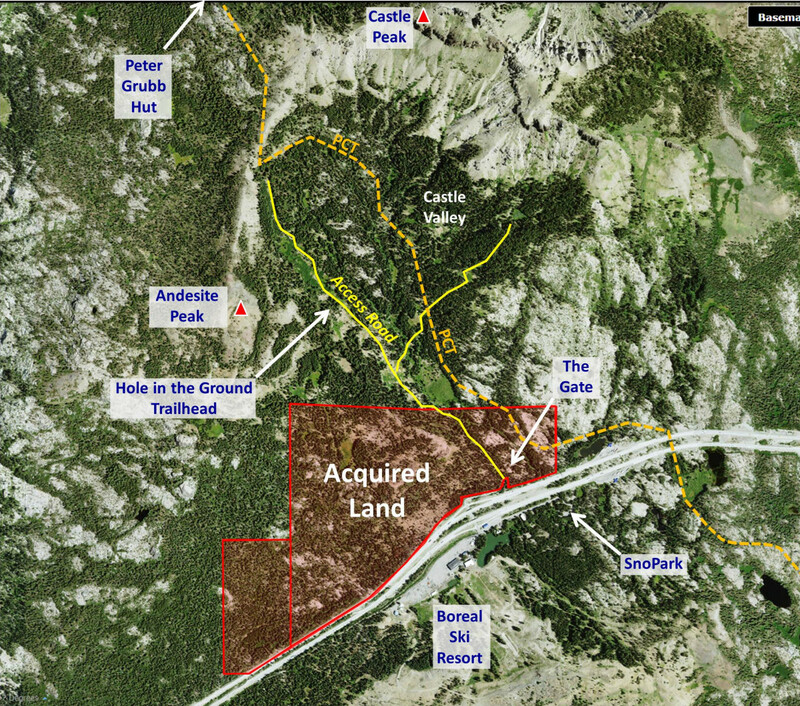 The acquistion was facilitated by the Truckee Donner Land Trust and The Trust for Publin Lands. The purchased lands are shown on the satmap below. The former privately owned parcels are adjacent to the north side of I80 directly across from Boreal Ridge Ski Resort. The Castle Peak area is a very popular area both winter and summer affording spectacular views of the Norther Sierra Nevada mountains. The conversion of this property to public lands pretty much makes all of the lands north of I80 in the Castle Peak area publicly accessible. While the Forest Service already maintained the Castle Peak and Valley area, control of the trailhead itself was somewhat unofficial. The Forest Service did control “The Gate” which is at the beginning of the unpaved access road that runs all the way up through Castle Valley. The Gate usually closes with the first snows and doesn’t open until summer. Winter parking has always been an issue. The paved spur road from the offramp is not plowed in winter and parking has traditionally been at the Snopark on the south side of I80. This has always been a hassle for skiers and snowshoers. With traffic from the Boreal ski resort, crossing back over I80 to get to the trailhead could be a little hairy. It’s not clear at this point if the Forest Service has any plans to create winter parking on the north side. This would be a welcome change to the current parking dilemma. During the summer when the Gate is open vehicles can drive up into Castle Valley and up to the Hole in the Ground mountain bike trail and PCT trailheads. Maintenance of the road has always been a little sketchy and 4 wheel drive and high ground clearance are recommended, especially in early summer when it can be quite wet. The road is also the gateway to Peter Grubb hut and Round Valley. Whether the Forest Service will implement new access policies to the area is unclear at this point. Things seemed to have worked pretty well in the past so there may be nothing to “fix” here. Considering that at one time there was the real possibility that these properties may have been developed, this conversion to public lands is definitely a positive for all of us that love the open spaces. Interested in climbing Castle Peak? See this post.